Hi everyone, this is my first trip report here. I am fairly new to backpacking. 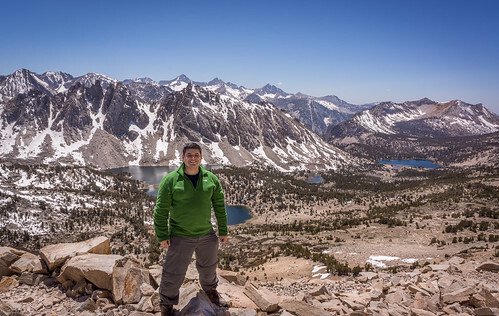 I started backpacking in the spring of last year with my wife in places around Southern California, and I instantly fell in love with it. 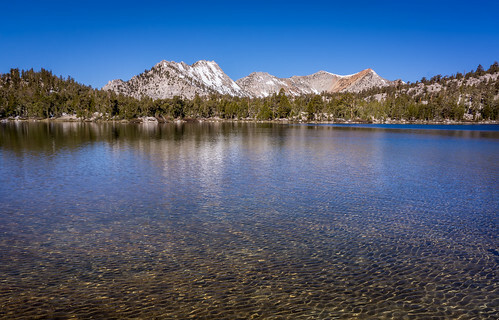 I did not make it up to the Sierras until last September when I did two trips-one in Yosemite (Cathedral Lakes down to Clouds Rest and Half Dome and then out Tenaya Lake) and one to Big Pine Lakes. I quickly realized what I mistake I made, waiting until the Fall to make it to the Sierras. 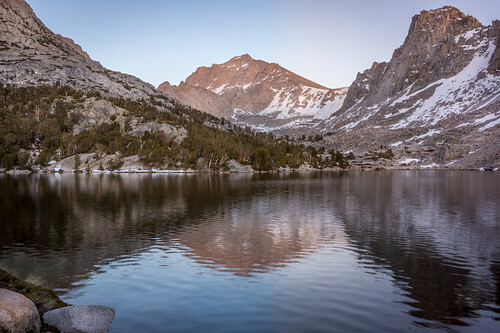 So, this year I plan to correct that mistake and backpack primarily in the Sierras. Here is my first trip of the summer. 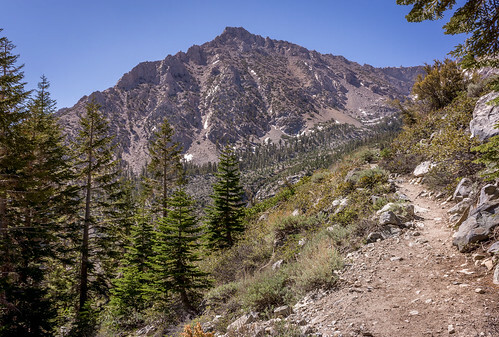 I headed up the trail from Onion Valley at about 10:00 a.m on Saturday morning. I took my time heading up the trail because I slept at sea level the night before. 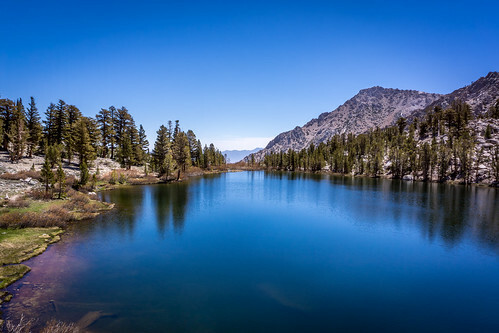 I made stops along the way at Gilbert Lake and Flower Lake to check out the scenery. 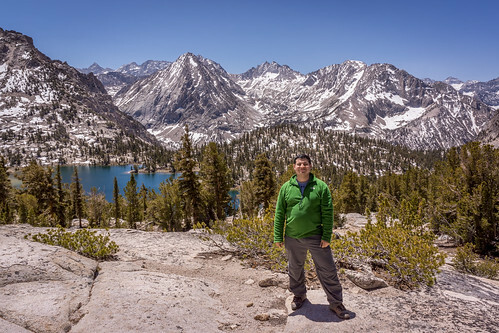 I made it to Kearsarge Pass at about 1:45 p.m. The climb up was not as bad as I was expecting, the gain was steady and moderate the whole way up with no particularly steep sections. For some reasons there was no sign marking the top of the pass even though I have seen the sign in other people's pictures. 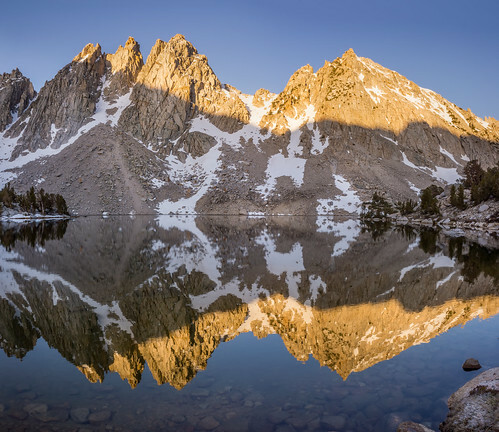 After enjoying the views at the pass, I headed down to Kearsarge Lakes to make camp for the night. I set up camp on a small hill above where the second lake meets the third lake. I then wandered around the lakes and found a good place to watch the sunset. 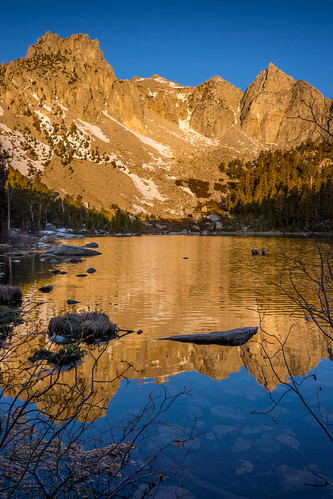 There is a bend in the third lake, so that you can watch the sunset over the lake in one direction, and then turn around and walk a few feet in the other direction to see the peaks above the lake light up. It was pretty cold that night, my tent completely froze on one side, but my feathered friends sleeping bag was up to the challenge and kept me warm. In the morning, I took a few more pictures while waiting for my tent to thaw. Once dry, I headed back on the trail and hiked down to Bullfrog Lake. 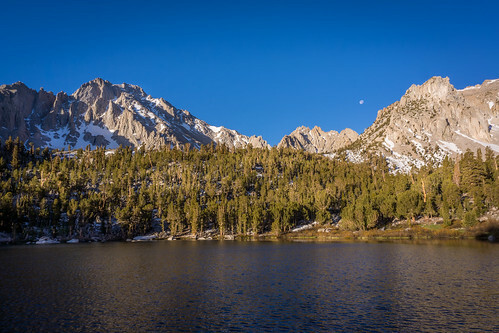 From Bullfrog Lake, I hike to the JMT and started making my way up to the junction with the trail down to Charlotte Lake. On the way up to the junction, I was treated to a pretty good albeit brief view up Bubbs Creek. 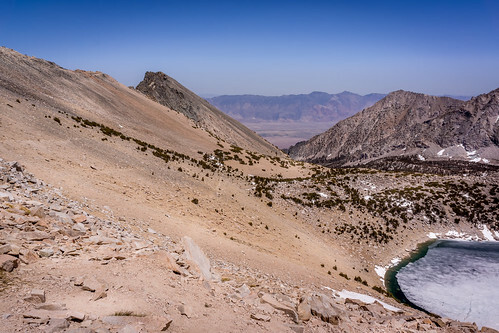 I then hiked down to Charlotte Lake, took a short break, and then started the uphill climb back to Kearsarge Pass. 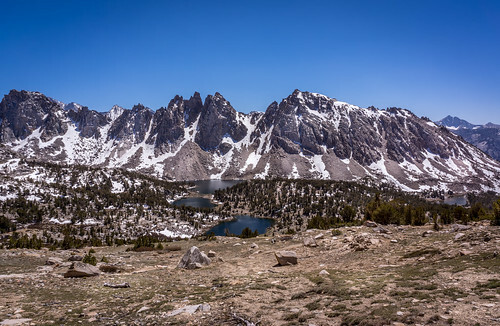 About halfway up the pass, the trail offered some great views down at Bullfrog Lake and the surrounding area. I made it back to Kearsarge Pass around 2:00 p.m., about the same time as the day before although I was a lot more tired this time. I then headed down to Flower Lake and start hiking up the trail to Matlock Lake. I was hoping to sleep at Matlock Lake, so I could have more solitude, but there was a decent amount of snow on the trail to Matlock Lake that required postholing and/or rock hopping. 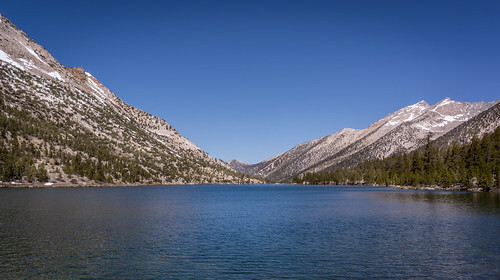 I made it about halfway to Matlock Lake, but decided I was too tired, and I just went back to Flower Lake to set up camp. 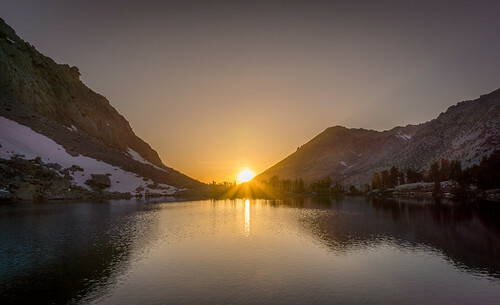 Monday morning, I woke up, took some sunrise pictures and then headed back down the trailhead. I made it back to the car by 7:30 a.m. Good Memorial Day weekend. Thanks for the trip report! Those are some beautiful photos you took. 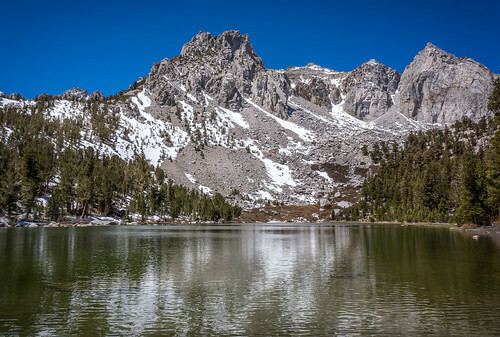 Back in 1964 my brother and I hiked into Bullfrog Lake with Trapper John backpacks and sleeping bags (not down filled) that were completely unsuitable for the below 20F temps of September that weekend. Why did we pick Bullfrog Lake? Because there was a picture of it in our family encyclopedia (World Book). Wow ! What a great first trip report. Thanks for posting. Great trip report and beautiful pictures! Thank you so much for posting. I may be taking my 10 year old daughter on this trip this summer. I am debating between this and the lakes behind Sabrina. Thanks so much for the report as this gives us an idea of exactly what this trip would be like! Beautiful first TR and pictures, and hopefully one of many to come. Thanks for taking the time and effort to post it. Thanks for your trip report. Appreciated the photos and the intel, especially regarding the trail to Matlock as I'm heading there tomorrow. Great report. Thanks for posting it! Great report and photos. Amazing how little snow there is this early in the season. Thanks for the trip report & pics. Doing a trip that way myself later this year.